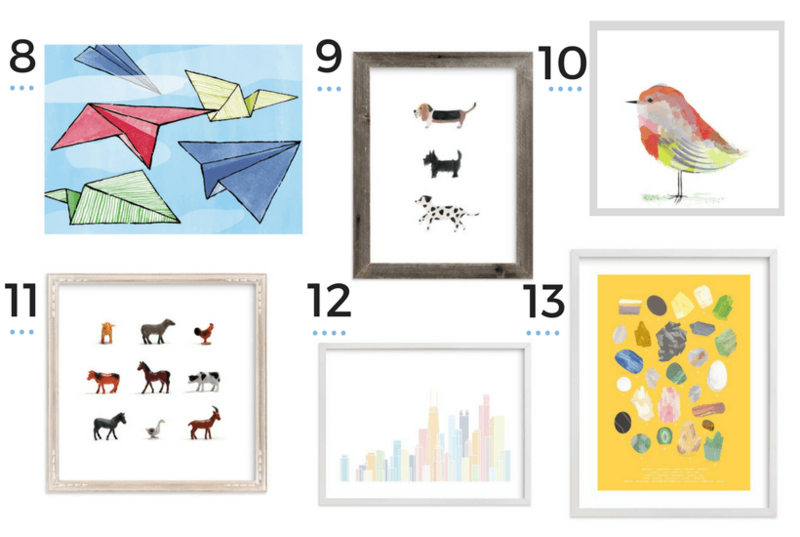 Inspiration boards for a happy and colorful children’s room from Minted Art, a carefully curated selection of playful art prints from independent artists. Affiliate Disclaimer: I belong to Minted’s affiliate program, which means I will receive compensation if you make a purchase after clicking on one of my links. Please click here to read more about our advertising policy. I like my kitchen to feel clean, my bedroom to feel peaceful, and my kid’s rooms to feel happy. There are plenty of reasons to smile when I walk into my daughter’s room. There’s the collection of beautifully illustrated books all lined up on my daughter’s shelves, her ever-growing family of bunnies grouped together on her bed, and the happy pictures hanging on the walls. 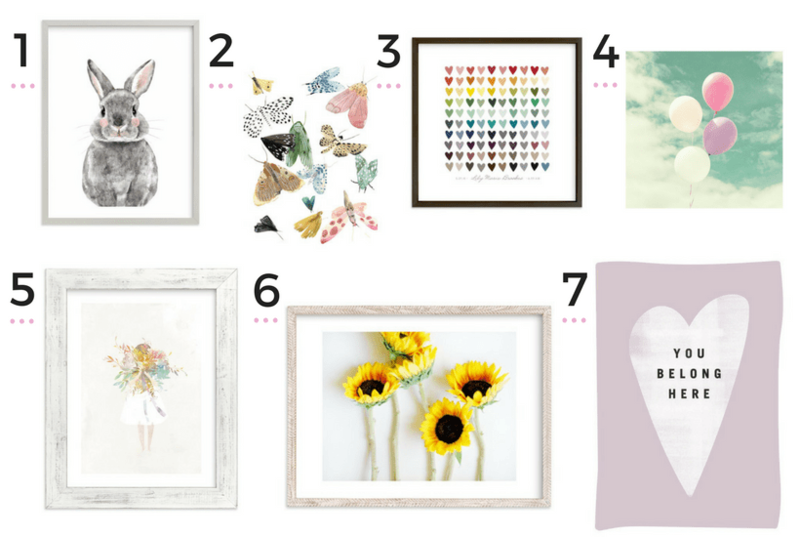 My little girl recently moved to a big girl bed and I wanted to update her room a bit, so I started looking for some playful art from Minted. I’ve used Minted several times in the last few years for birth announcements and holiday cards. Over the years, the Minted marketplace has expanded from stationery and invitations to art to home accents. They have many different designs, a simple checkout process, and excellent customer service. They sell fine art prints in all different sizes with many different framing options as well. Did you know that when you buy through Minted, you’re supporting independent artists and designers? I’m always trying to get my more artistic friends to submit designs to Minted contests. The Minted marketplace features art to suit many different tastes and personalities, so there’s not just one dominant look. I’ve put together two different inspiration boards with my favorite playful art prints for kids. If you’re looking for playful, happy, art for your kids’ rooms, then definitely check them out! Bouquets of bursting flowers, balloons in flight, and a touch of pastel pink. From tiny figurines to rare gems, I love these images of things an adventurous child might feel compelled to collect. There are tons of cute options for kids at Minted right now! One of my favorite ways to navigate through the site is to use click the favorite button that appears on the bottom of each design when you navigate over it, which files all of your favorites into one place. At the end of a browsing session, I review my favorites and start sorting them by color and theme. It’s interesting to see how the different designs “talk” to one another in this way. Each print allows you to choose from a wide range of sizes and there are tons of framing options, too. Interested in other things that help me make my kids’ rooms extra happy? Check out my article on how to save money at Pottery Barn Kids (PBK often makes me feel happy) and my favorite (happy) crib sheets from Target.